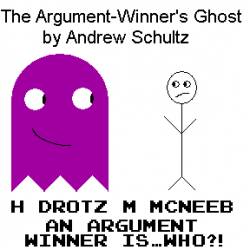 The Argument-Winner's Ghost (Andrew Schultz; 31-Oct-2013; Z-code). Ectocomp 2013: 11th place of 25 entries. Dropbox link to post-comp beta. Do not play this for EctoComp judging purposes. Use the link above. Release source code. Source code for release--comments will be added with bugs, etc. Latest source code. This is the latest source code for the game. It will be annotated and bug-fixed as I am up to it. The Argument-Winner's Ghost - at IFDB. This page was last modified on 25 June 2016, at 00:53.